When picking through your snaps in iPhoto, do you wish you could zoom into or rotate your images with a pinching or twisting gesture? If so, Apple has answered your pleas. The Magic Trackpad brings the MacBook's trackpad technology to Apple's desktop range, and does so very well. The Magic Trackpad is styled to perfectly complement your Mac's keyboard. 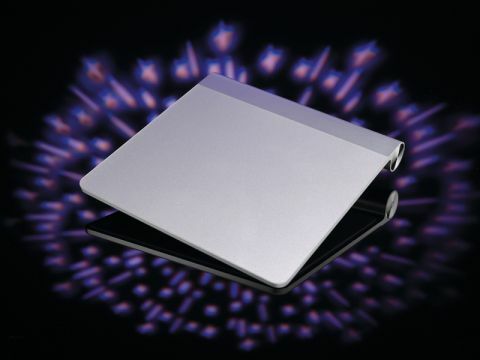 It's made from the same brushed aluminium and sits at the same angle on your desk. It's a different experience to using a MacBook trackpad though. For a start, at around 13cm square, it's roughly 80% larger than a MacBook trackpad. If you own an Apple notebook, or an iPhone or iPad, then the Trackpad's pointer control and gestures should be familiar. Drag a finger around the pad to move the cursor, and two fingers to scroll. The whole surface of the pad acts as a mouse button, and you can set it up to replicate the functionality of a one-button or two button mouse as you wish. But it's the gestures that really shine. Scrolling, pinching, swiping, app switching, screen zoom, double-click – it's all at your fingertips. The Magic Trackpad is fully configurable via a new System Preferences pane installed with the latest software upgrade. Inertial scrolling, introduced to the MacBook Pro range this year, is also catered for. With this feature switched on, a scrolling window doesn't just stop when you lift your fingers from the Trackpad, but maintains a momentum depending on how fast you were moving it. The Magic Trackpad can't replace a mouse for everything. Gamers in particular need the greater precision offered by a mouse, and a graphic artist would be better off with a proper pen-based tablet device, but for general productivity and day-today computing, the versatility offered by a trackpad is very welcome. If you're running Snow Leopard on a desktop Mac, then the Magic Trackpad could become a permanent fixture on your desk, but next to – not instead of – your mouse.